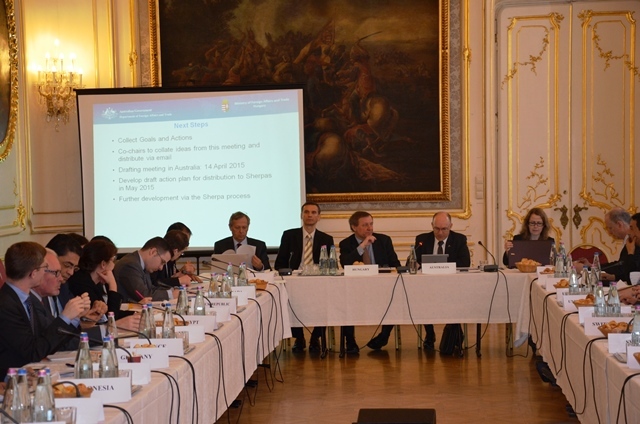 On March 9, 2015, a meeting of the Nuclear Security Summit (NSS) IAEA Drafting Group was convened at the premises of the Hungarian Permanent Mission in Vienna in order to exchange ideas regarding the Action Plan to be elaborated on the role of the IAEA. On March 9, 2015, a meeting of the Nuclear Security Summit (NSS) IAEA Drafting Group was convened in order to exchange ideas regarding the Action Plan to be elaborated on the role of the IAEA. The Drafting Group meeting was jointly coordinated by Hungary and Australia, and took place at the Permanent Mission of Hungary to the international organizations in Vienna. Thirty-five Member States participated in the Drafting Group meeting, in addition to representatives from the EU and the IAEA. The Action Plan will be further considered at the Drafting Group meeting on April 14th in Canberra.